On 21 March 2019, Keukenhof will be opening its gates for the 70th time. When it closes eight weeks later, some 1 million visitors from across the world will have visited the international flower exhibition. As such, Keukenhof makes a contribution to tourism in the Netherlands. 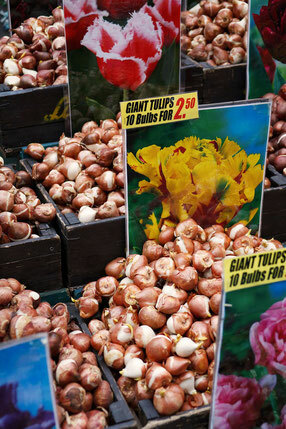 One hundred bulb growers will supply bulbs to the park and 500 growers participate in the flower shows. In the past year, the Lisse park has in fact recorded one and a half million approx. of visitors from all over the world, drawing the accesses of the previous year. 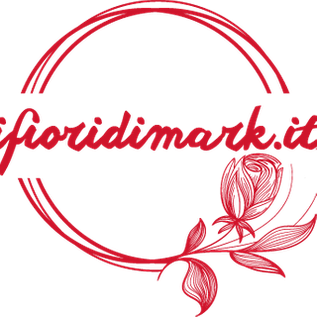 The average age of the "guests" has been lowered thanks to the presence of a greater number of visitors made up of families with children or groups of twenty and thirty years old that the passion for gardening, flowers and plants is now part of every age. The Keukenhof flower exhibition is situated on Landgoed Keukenhof [the Keukenhof Estate] that developed during the seventeenth century. The first part of the current castle was built in 1642. The estate now measures some 240 hectares and is home to 15 Rijksmonumenten [listed buildings]. 50 hectares are used for the flower exhibition. The estate is owned by a foundation charged with preserving Landgoed Keukenhof. 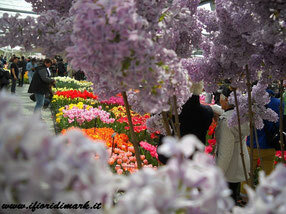 Keukenhof is the platform for the Dutch floricultural sector. For the exhibitors and participants in the flower shows, it provides a superb showcase for their bulbs, flowers and plants. The park is redesigned every single year. Keukenhof's designer takes inspiration from the latest trends and adapts the design to suit the specific wishes of growers. This in turn provides inspiration to the visitors who gather new ideas to apply at home. In the flower shows, the arrangers also put the latest gardening ideas into practice. All of this enables Keukenhof and the growers to support and strengthen each other. Photographs of Keukenhof make their way around the world, reaching millions of consumers. The world's press is also eager to report on all the beautiful things on display at Keukenhof. Of the total share of visitors, 15% has links to the trade and numerous trade events are organised for growers. Keukenhof is an excellent meeting place for business contacts, and the organisation has strong links with all the relevant organisations in the sector. Each year, forty gardeners plant 7 million bulbs at reserved locations throughout the park. At the end of the season, these bulbs are harvested and a new cycle of planting, blooming and harvesting begins again in the autumn. The inspirational gardens give visitors the unique opportunity to gain ideas for their own gardens. The Molenbos [windmill woods] have been develop in the woods next to the windmill for 2018 and feature bulb varieties suited to this amp, woodland environment. For children, Keukenhof has a maze, a playground, a Miffy house and a petting zoo. A treasure hunt takes them to the most beautiful places in the park. Keukenhof has its own sculpture garden. A network of artists will be exhibiting around 100 pieces. The art exhibition is characterised by a wide variety of styles. The pavilions feature a changing selection of 20 flower and plant shows. Growers exhibit a wide variety of flowers and plants in all different colours and shapes. Of course, all of them are of the highest quality! This is the pinnacle of the competition among the growers to decide the best horticultural product, varying from tulips to roses. An expert judging panel will choose the best flower in each category. The increasing interest in Keukenhof demands a sustainable solution for Keukenhof to welcome and receive national and international visitors. The new entry building provides access to the most beautiful spring park in the world. Keukenhof has a carpark for 4,500 cars and 1,000 coaches. This will have a positive effect on traffic management around the park. Keukenhof works continuously to improve quality and service for its guests. The tulip is the distinctive icon of Netherlands throughout the world. And Keukenhof can do no other than give the tulip centre stage. The Willem-Alexander Pavilion is full of tulips in bloom. An exhibition being organised in the new Juliana Pavilion shows the history of the tulip, 17th Century tulip mania and today’s tulip as contemporary icon. The renovated Historic Garden contains extra information about the origin of the tulip. Many international tourists still come to the Netherlands for the special Dutch icons: tulips, windmills, Rembrandt and the canals of Amsterdam. These typical Dutch icons tell the story of the Netherlands. Keukenhof works together with major tourist partners to positively promote the Netherlands. Keukenhof’s importance to tourism in the Netherlands is huge. Annually, 1 million visitors from more than 100 countries are welcomed. These don’t only include individual visitors, but also companies, institutions and organisations wishing to show their (international) guests what the Netherlands has to offer. Approximately 75% of visitors come from abroad, with the most important countries being Germany, United States, France, United Kingdom and China. There is a particularly significant growth in the number of tourists from America, China, India and South East Asia. The bulb sector in general, the tulip and Keukenhof in particular, are vital to the tourist image of the Netherlands. The park acts as a large magnet, attracting visitors to its own sector as well as the hospitality industry, retail, overnight accommodation, transportation companies, museums and other attractions and events. In addition, Keukenhof attracts visitors during a period when there are few other attractions available. Keukenhof is an icon: for the floricultural sector, for the Bollenstreek region and for the Netherlands, making a significant contribution to the image of the country. For example, the website of the highly regarded travel guide, Lonely Planet, opens with a feature on Keukenhof. Wikipedia has just one photograph of the Netherlands: of Keukenhof. More recently Keukenhof was awarded the Certificate of Excellence by TripAdvisor. Flower Power is the 2019 theme of Keukenhof. The strength of the flowers that unites people and visitors who will come to the park. Holland is famous for its bulb fields and for the many flowers cultivated here. Bright colors, hippies, peace and music. Flower Power has that atmosphere of the 70s. A great theme to celebrate the 70th Keukenhof. Flower Power, the strength of flowers! The park will remain open from March 21st to May 19th. March23-24th : Sound of Holland: to celebrate the beginning of spring and the opening of the park, choirs and Dutch bands, will visit the park to brighten the days of the first visitors. March 29-31st : Holland heritage weekend: this is the perfect Weekend to discover the nineteenth century Dutch traditions. Traditional markets, folk dances and much more to celebrate the old Dutch traditions. April 5-7th: Flower power: weekend dedicated to flowers. At the market the growers will explain the characteristics and use of the bulbs, giving the possibility to buy new ones. Saturday 6th and Sunday 7th, children can participate in a floral treasure hunt. April 27th: Keukenhof King's day: the day of celebration for the whole of Holland, Keukenhof also organizes traditional activities. April 29th: shows of birds of prey: between 12 and 14.30, hawks, eagles, owls and buzzards, will fly above the park showing all their beauty. 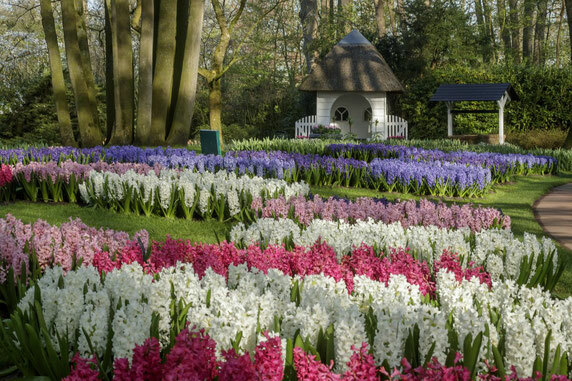 May 11-12th: Romance at Keukenhof: Being transported to the 19th century, surrounded by people in romantic folk costumes and watching orchestras, soloists and ensembles play among the flowers. Romanticism at the Keukenhof will be organized in collaboration with De Cultuurbrigade of Rotterdam. May 13-19th: woodstock festival: relive the moments of peace of 1969 among the flowers of the Dutch park with a divine music and a relaxing atmosphere. The Keukenhof park will remain open from 21 March to 19 May 2019. Reaching it is really simple, both from Schipol airport and from nearby locations such as Haarlem, Leiden, Noordwijk, etc. Visiting the official website of the park you can buy the entrances with bus travel included.